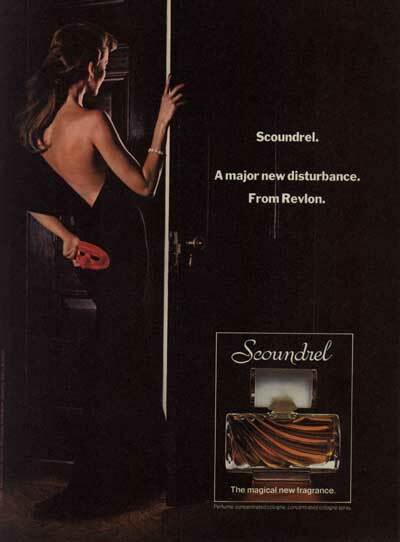 Using Scoundrel causes a woman to attract men, just like a female ape in estrus attracts males of her species. S/he wants women to buy this perfume, or men to buy it for them. This very attractive model is dressed in a seductive black, backless dress. She clearly wants to attract one or more men. As no wedding ring is visible, she may well be unattached. Aside from her skin, and the bottled perfume, the only color in the ad is the red mask she is holding behind her. This fact draws our eye and attention to it. On the surface, it appears that she might be attending a masked ball or party, and is absent-mindedly holding the mask behind her. But closer examination shows that this cannot be the case. When you imagine her moving her hand back to her face to cover her eyes with the mask once again, you'll see that the mask would be upside down. Also, place your hand in the same position as the one holding her mask. Such a position feels awkward; it is very unlikely that anyone would absent-mindedly rest a hand like that. The photographer clearly had her hold the mask in that position for some other reason. Here is one plausible possibility. Females of several primate species develop a swollen, red protuberance on their rears, just above their genitalia, during the times of the year when they are sexually receptive. Additionally, at these times they produce odors that excite the males of their species. In this context, the red mask, located as it is, and the odor associated with perfume give special meaning to the ad's second line of text, "A major new disturbance." As males in other species often fight over sexually receptive females, the disturbance could indeed become major. The producer of this ad probably believes that as primates, human viewers would subconsciously recognize the estrus symbolism and connect the primal urges they'd feel to a conscious desire for this perfume. "In some species of Old World monkeys and apes, adult females have sexual skins or swellings, which are nearly hairless large swollen patches of skin around the genital area that become very prominent when they are in estrus. These areas swell with fluids and turn bright pink or red due to hormonal changes that occur in preparation for ovulation. The sexual skin also produces odors that excite males of the species. They become highly attentive to the females at this time. In the case of olive baboons, males are most attracted to females with the largest sexual skin bulge. Those females tend to have babies more often and subsequently pass on the genes for this impressive signal of sexual readiness." His page also displays this picture of a female Hamadryas baboon in estrus. This ad ran over time in different magazines. Advertisers test consumer response to individual ads, and do not reuse those that fail to generate expected sales.